The first modifications were some simple ones to improve airflow — namely, extending the chimney down to grill level and sealing some of the air gaps with JB weld. 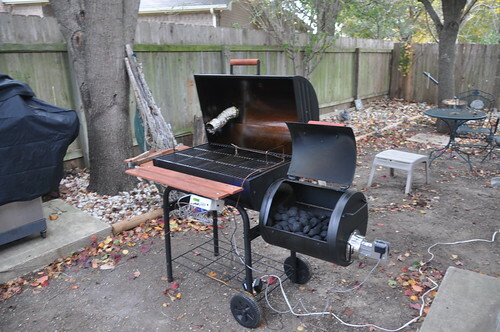 You can also see in that picture part of the electronics setup: the stoking fan, a 10cfm fan which can be turned on and off electronically to control the rate at which the charcoal burns (and thus, the smoker temperature). Normal smokers depend completely on the chimney effect, which works well, but the only way to control airflow is by adjusting the intake and outflow openings, which is inexact and can also be greatly affected by wind conditions. This is a Stoker, from Rock’s Barbque. Based on a TINI board, it has 5 inputs and outputs for temperature sensors and fans, as well as the user interface you can see here for controlling the fans and configuring temperature setpoints. It also has an ethernet port, which I have connected to a wireless bridge (you can see it hiding above the controller in the picture above) so that it can connect both to my local network and the Internet as well. 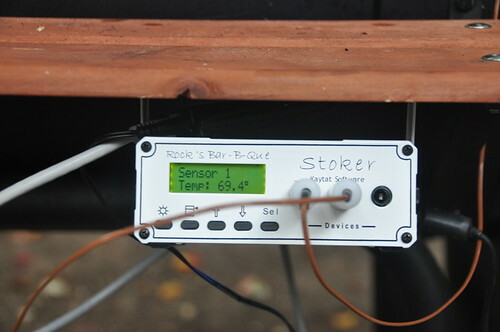 Here, I have Sensors 1 and 3 set up in different locations in the smoker, pulling the ambient (‘cooking’) temperature. 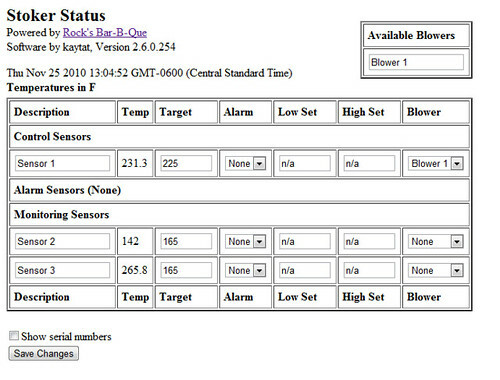 Sensor 1 is controlling Blower 1 (the fan), and if the temperature goes past the target, the fan will turn on or off (some hysteresis is introduced to keep the fan from turning on and off rapidly when near the target temp). 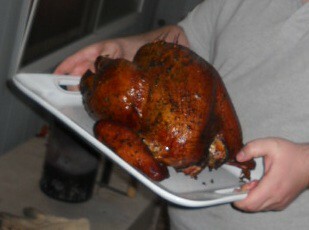 As you can see, I started the smoker around 9:30, added the bird at around 10, and proceeded to cook it for about 5 hours. 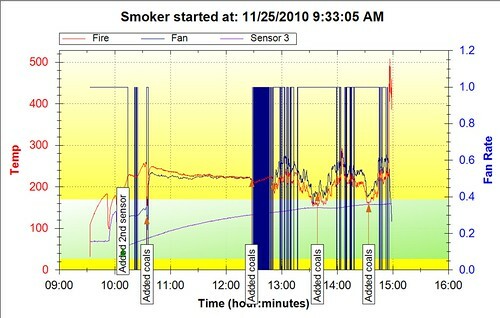 Here, the purple line is the temperature according to a temperature probe inserted into the deepest part of the breast, and the blue line moving at right angles is the fan output, either on or off. 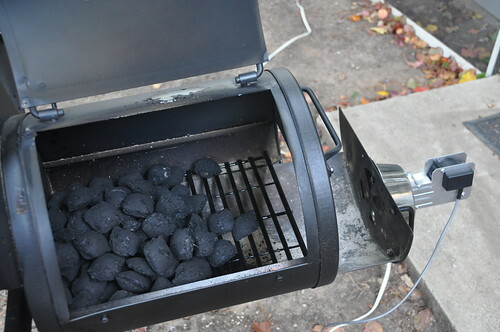 One of the best things about the smoker setup is that I no longer have to watch it like a nervous mother hen — I wasn’t even at the house between 10:30 and 12, but I never worried because I’d forwarded a port on my router to the stoker’s web interface and could check on it as much as I wanted. Wondering, as I was, where the ‘Move Window’ option went to? Or the Restore/Size/Move/Maximize/Minimize options? Just shift-right-click on the app in the taskbar and you’ll get that menu. It makes me appreciate companies like SliceHost, who don’t offer an SLA and aren’t afraid to say so. Over at the EngineYard blog, they have a couple of posts on working with RoR apps at scale, on general scaling and on sharding your database. We’ve had to do a few of these things already for certain customers and will hopefully have to do more in the future, but I think one of the important takeaways is that you shouldn’t do any of these things before you actually have a need to. Almost all optimizations for performance are going to introduce some amount of friction in your development process and possibly add failure points, as well — and if you have a solution that works right now, and is going to work for what you estimate the load to be over the next month or two (depending on your release cycle), then you have solved the problem you have right now, and should spend that time adding features or fixing bugs instead. In a comment to the page, Gregg Pollack points to his screencasts on Scaling Rails — I haven’t watched them yet, but he had a good session on ActiveRecord at last year’s Lone Star Ruby Conference.